Let me tell you though this recipe not only resulted with blood spilled but also me passing out after only barely making it up the stairs before I collapsed. Well it wasn’t from a sweet rush or the flavour, but I have a big tip. When you coat this in chocolate and let it set don’t do it on a plate, and don’t try and prize the bars off said plate with a steak knife….. you may just stab yourself! Anyway, stupid injuries aside this is a great recipe. Next week I am heading into a carnivore phase so I am making a few “fantasy” recipes that are still low carb, compliant and stupidly simple to make. I mean this recipe is far from hard but you do need the right ingredients. 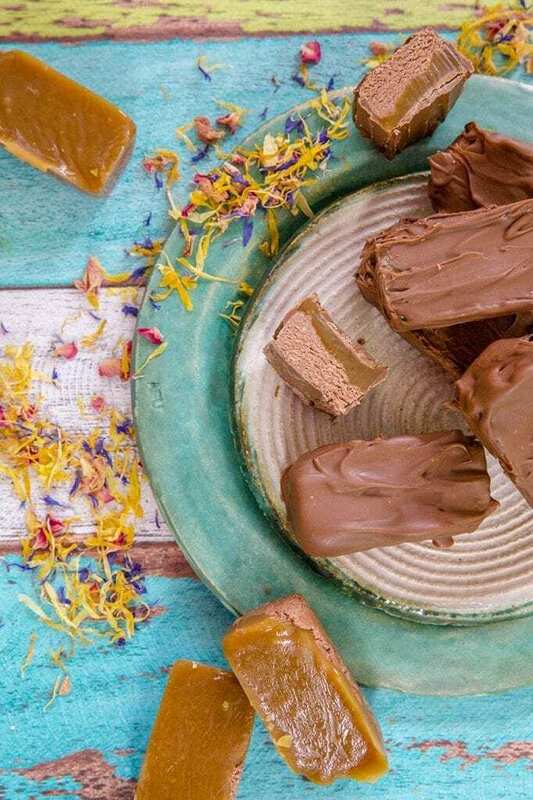 If you are familiar with how I do my caramel and protein bars then you will know that this is yet another Sukrin product recipe. I like using these products as the end result is amazing and they are so easy to convert a standard recipe to keto. It is funny that once upon I time I had members telling me I should become the supplier when it left Australia, and I was like yeah…nah! Damn I should have! It has so many great applications in both sweet and savoury recipes. Anyway at this stage NO there is no substitute for the fibre syrups in Australia, so don’t ask as you will need to buy from the one only supplier supplier in Australia. I have included the links within the recipe. For those of you around the rest of the world seek your local supplier or substitute Vitafibre (the only other product I believe will have similar results). To get the perfect caramel please watch the “steamy” video below to see when it is at its best “plop” stage. 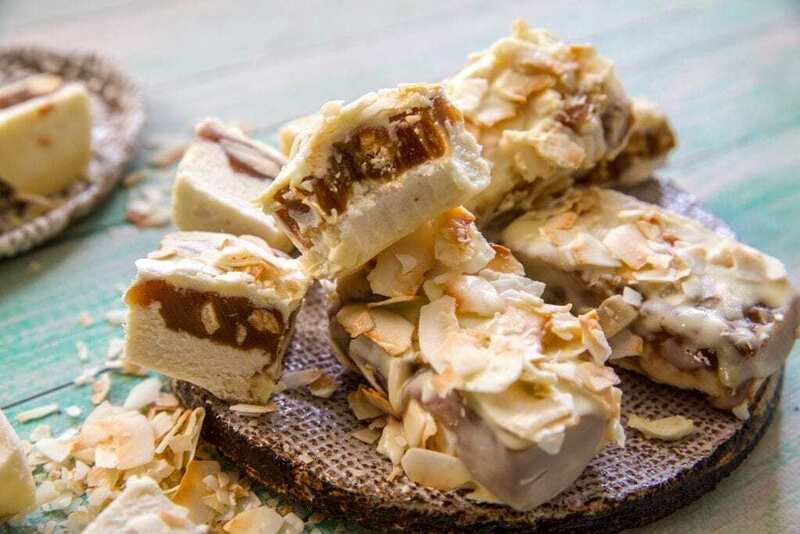 Yes this recipe is totally inspired by From-Mars Bar recipe that is insanely yummy, even if this “Mars Bar Hater” says so. 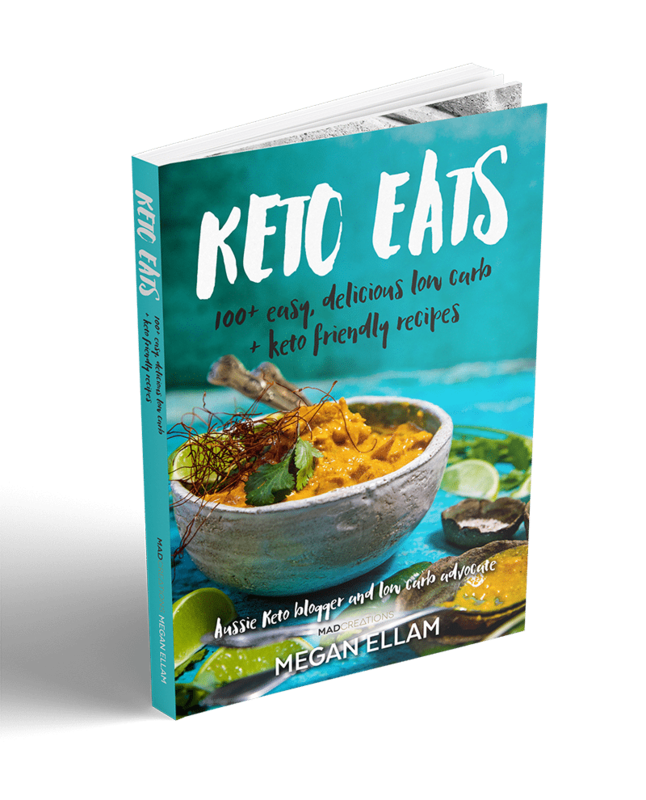 I have just released my brand new book Keto Eats for pre-sale with over 100 keto recipes that you will L-O-V-E. I mean this book is jam packed, beautiful and the recipes have all been triple tested by a team of 40 testers and I am more than happy to put my name on the front cover. To grab your copy head to the shop on the site or to my store at Lowcarbmixers click here>>. We seriously have a fabulous Facebook community of over 17000 members. Join us above and share your keto journey with us. This protein bar is delicious on every level. Not for the weak who might over indulge but a perfect treat for the impending festive season. I used a silicone bar mould that is now expired. A silicone large icecube tray would be perfect for 32 x 4cm mars bites. Preheat oven to 180℃. Lightly toast chopped almonds until lightly golden. Reserve. Place clear syrup and white chocolate in large pyrex bowl and microwave for 1 minute. Stir to combine and melt chocolate. Combine chocolate mix with WPI and MCT oil and mix until combined. With a gloved hand massage mix until it is no longer grainy. Place all caramel ingredients into a large pyrex bowl. Heat on high for 3 minutes. Carefully remove from microwave stir mixture and return to microwave. Continue to heat at 1-2 minute intervals until mixture looks very bubbly when you take out and when stir becomes thicker and more viscose. At this point you will definitely smell a caramel scent. 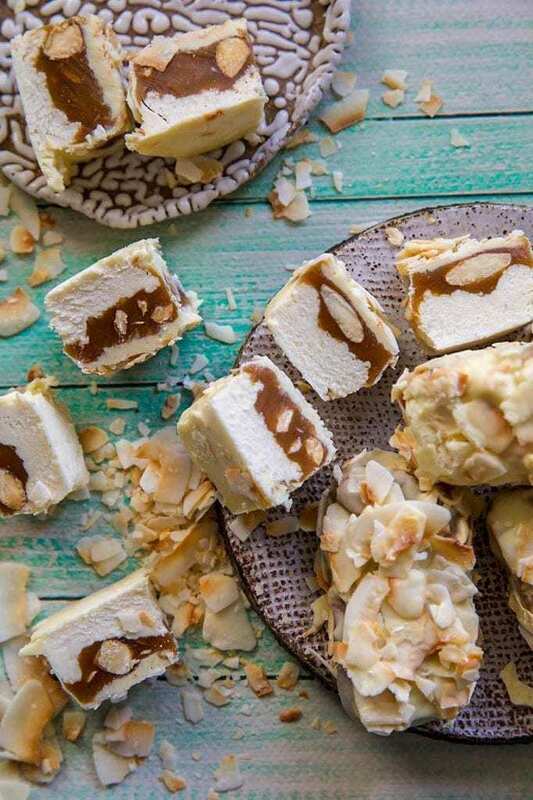 Carefully spoon the hot caramel into your moulds and top with toasted almonds. Melt chocolate and coconut oil and thinly coat each snickers bar. Place onto piece of baking paper. 1. At this point there is no keto alternative available in Australia for Sukrin fibre syrup products. I make these recipes with the products because I can easily replicate many recipes that previously would have been created with sugar products. The main ingredient is Isomalto oligosaccharides in the syrups, a sugar alcohol that passes through the body undigested. These products contain very little carbohydrate and low calorie. 2. Chocolate: for the Milk Chocolate you can use any of the following 0 sugar varieties Sukrin Milk, Vitawerx, or Well Naturally. Each of these brands offers a low carbohydrate, no sugar at all, and low calorie option. This recipe is suitable to be done with any kind of chocolate white, milk or dark. 3. The bars are best stored in an airtight container in a cool dry place. If refrigerated you will find that they are a lot harder, just like the real thing if stored in fridge or freezer. 4. All keto sweets should be a sometime food. 5. Please use caution when making the caramel. The instructions for the microwave are open in time as many microwaves have different wattage. In mine at 750W I find the caramel takes around 8-10 minutes. As it starts to get a little thicker you will notice if you check your spoon after 30 seconds you can gauge what "ball" or setting stage your caramel is at. For your convenience I have included a video to show you the look and feel the caramel has when it is ready to pour. 6. It should be noted that due to Sukrin labels including net carbs on the label this recipes carbs are calculated as net carbs per portion. These bars look soooo good Megan!! Yum! Yes, yes, yes. YUMMMM god, I wish I had one of these right now. They look SO good Megan. Great post!! Need to make me some stat. Not sure what prices you are referring to Maree, but all my products are in Aussie dollars and have a conversion available if you are not Australian.